Earlier, I shared some of my favorite decorating ideas for spring including these DIY rustic succulent pots. 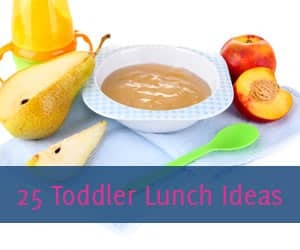 While I love that idea and think it is super cute, it does require you to spend some money. For instance, you have to buy the terra cotta planters and the paint in addition to the plants and soil. 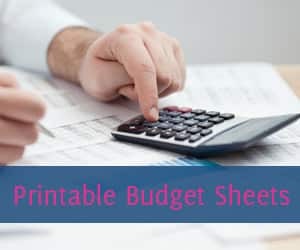 Don’t get me wrong, this is no budget buster, but I’m always looking for ways to do things cheaper. This led me to these DIY tin can planters. 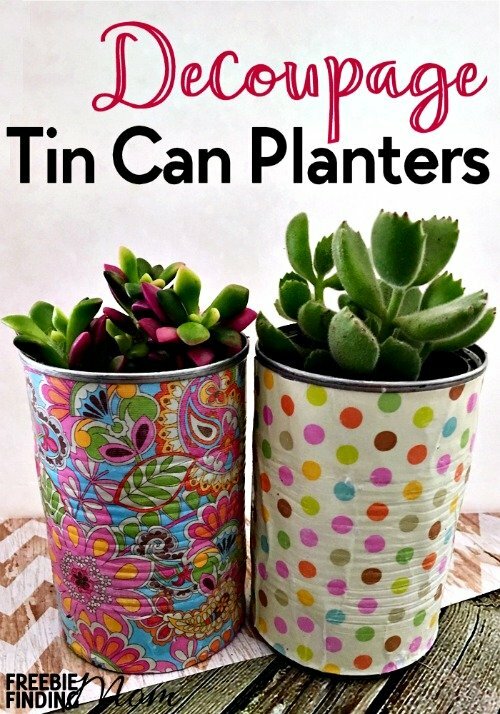 DIY tin can planters allow you to save money because you don’t have to buy as many materials. 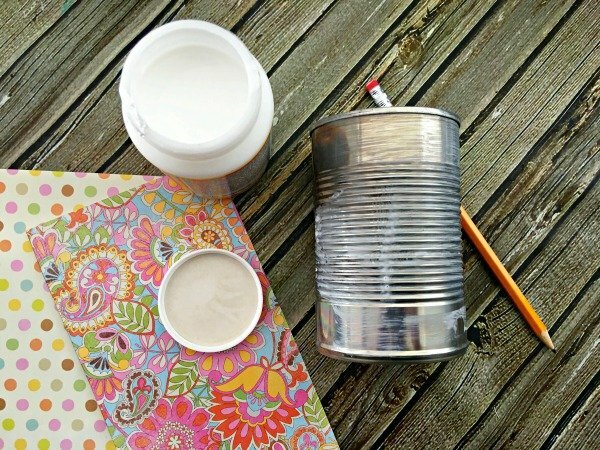 The materials you do have to buy for these DIY tin can planters are pretty inexpensive, for example, scrapbook paper. 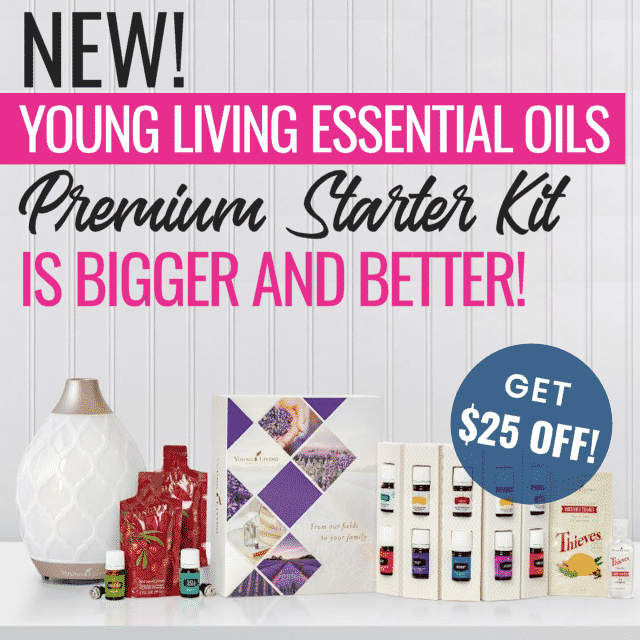 You can make that purchase even cheaper by looking at clearance options. 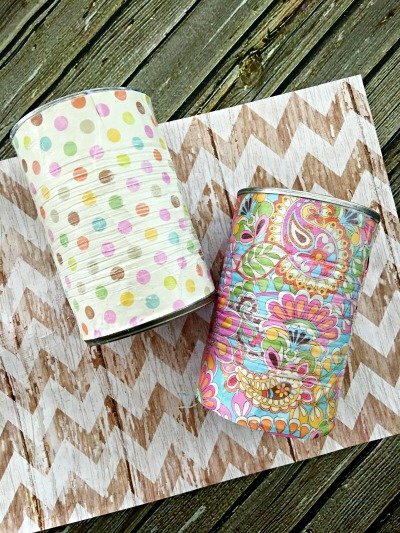 Regardless of your decorating/color scheme, these DIY tin can planters can brighten up your home. That’s because scrapbook paper comes in every color and pattern imaginable. 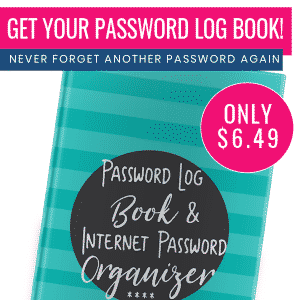 Seriously, take a look the next time you’re at a craft store. The wide variety to choose from means you can easily add DIY tin can planters to any room of the house or even give them as a gift (ex. at a housewarming party). So, all set? 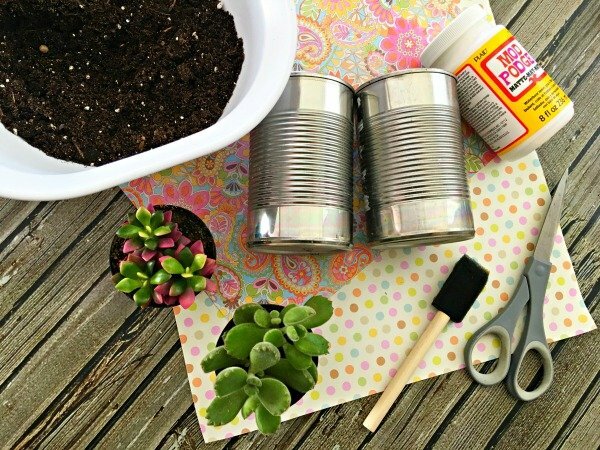 Let’s get started with these DIY tin can planters! 1. 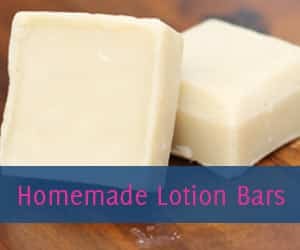 Remove the label from the soup cans, and wash and dry them. Tip: Make sure you use cans that aren’t sharp on the top. 2. Measure each can from the top to the bottom; write the measurement down. Tip: If you’re using two identical cans (ex. each was Campbell’s Chicken Noodle), you only need to measure one can. 3. Then measure the length around each can; write the measurement down. Tip: If you’re using two identical cans (ex. each was Campbell’s Chicken Noodle), you only need to measure one can. 4. Cut two pieces of scrapbook paper to your exact measurements. 5. Paint a heavy amount of mod podge around the outside of the soup cans. 6. Adhere scrapbook paper around each can. 7. Press down firmly and smooth paper out. 8. 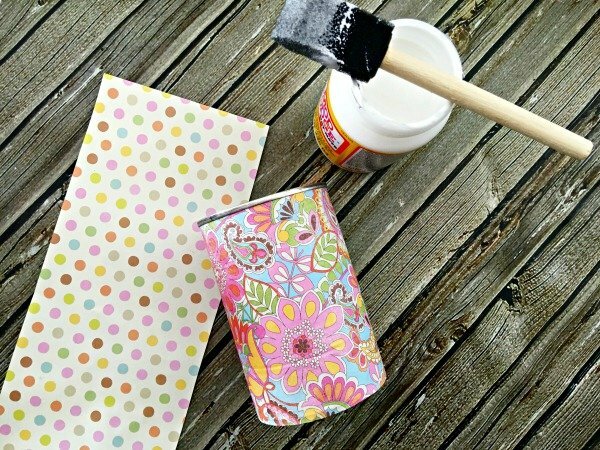 Paint another layer of mod podge over top of the scrapbook paper. 9. Use your finger nails to press the paper into the can indentations; doing this allows the can’s details to show through the paper adding more character to the DIY tin can planter. 11. Replant succulents with succulents soil. 12. Display DIY tin can planters around your home! Want to introduce your kids to plants and gardening? 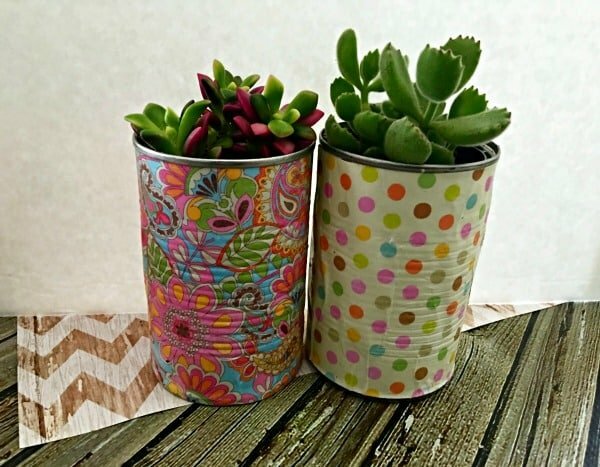 These DIY tin can planters with succulents would make a great first plant for them to take care of. If you want more plant/gardening ideas for kids, read Discover the Best Plants for Kids and Make Gardening Exciting. 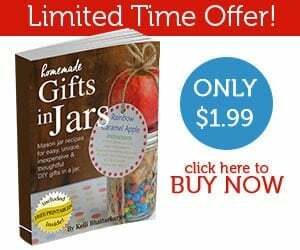 If you’re looking for more fun, frugal, and easy DIY activities, like these DIY tin can planters, be sure to follow Freebie Finding Mom’s DIY Fun and DIY Home Decor & Improvement Pinterest boards. Thank you for sharing this beautiful, amazing and simple craft idea with tin cans! You’ve made this lady in Michigan so happy as I’ll have crafting to keep me busy while in my recovery for leukemia. You’re awesome and an inspiration! Can’t wait for more ideas and instructions from you!